Tagged microhousing, world urban forum. MALAYSIANS shop, work, eat and party in Kuala Lumpur’s city centre – but nobody really lives there. A 2014 study by urban regeneration organisation ThinkCity showed that while daytime KL bustles with the 54,000 people who work there, nighttime KL is a ghost town with less than 5,000 people. The reason could lie in its insanely high property prices: when a studio apartment comes with a six-figure price tag and the average Malaysian earns about RM5,000 a month, it seems that only the one-percenters can afford to live in the city. It’s no surprise, then, that people opt to live in the suburbs where a three-bedroom condo rents for about RM1,500 a month in Damansara, compared to over RM4,000 in the city centre. The result: an almost-silent KL after working hours. This is worrying for Kuala Lumpur City Hall (DBKL): if KL isn’t a desirable place to live, it might soon become less desirable to work in as well, and that could affect the city’s businesses and workforce numbers. The plan is completely accurate – while population numbers have fallen in the city, satellite cities like Damansara and Petaling Jaya have not only boomed population-wise, they’ve become food and entertainment hubs that easily rival KL. This has caused DBKL to shift into high gear in order to solve this issue. “We need to try and bring young people back into the inner city, and to do that we need to make housing affordable,” said technical advisor for ThinkCity, architect Ng Sek San. One easily achievable way to do that is to make them small. 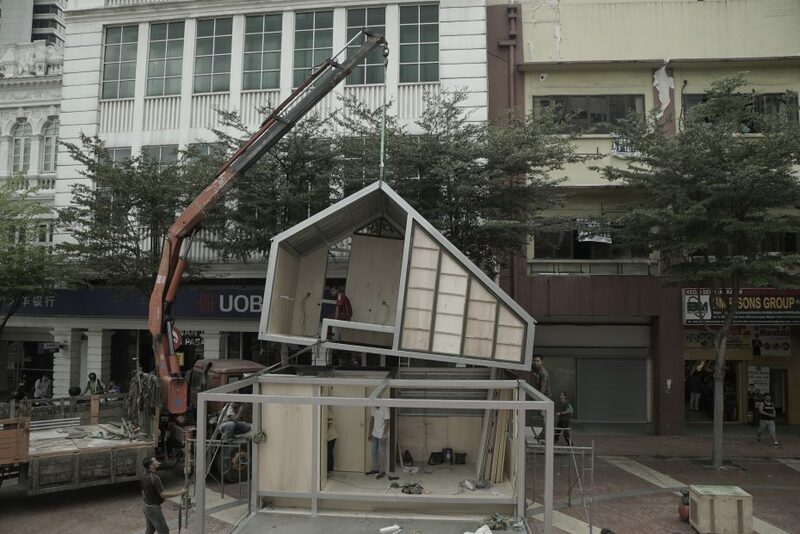 The micro house was assembled at Kongsi KL before being transported in four parts, to Medan Pasar, for the World Urban Forum. This is the size of architecture firm Tetawowe Atelier’s 2-story, prototype microhouse. “Thanks to better public transport, car sharing services and maybe even self-driving cars, Malaysians might not need car parks anymore,” said designer Wong Wei Ping. These potentially-unused car parks could be the sites for what the architects call an “urban village”. 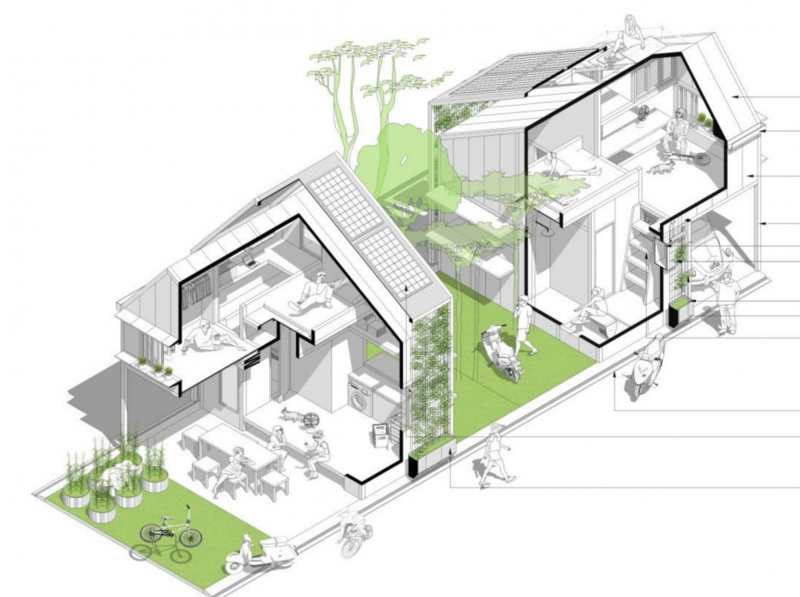 As the prototype has a pitched roof, they envision clusters of these homes arranged on a rooftop car park, with landscaped spaces between homes used as shared recreational space and other areas designated as communal kitchens and urban gardens. However, tiny doesn’t mean cramped. Despite its size, the well-designed house still manages to fit a large porch, living space, a pantry, a bathroom and even a second floor bedroom. Many of the spaces can be enlarged according to your needs, thanks to folding wall partitions. “The idea is actually for young, single people to live here. People who want to enjoy urban living, to contribute to the city and interact with other people,” said Wong. This artists’ rendering shows how the interior layout of the microhouse could be adjusted for the needs of different people. As this prototype is just the first step in testing the concept in KL, there are no firm price points for renting or buying such a unit. However, the goal of the project is to create these homes at a price that is affordable for young professionals. 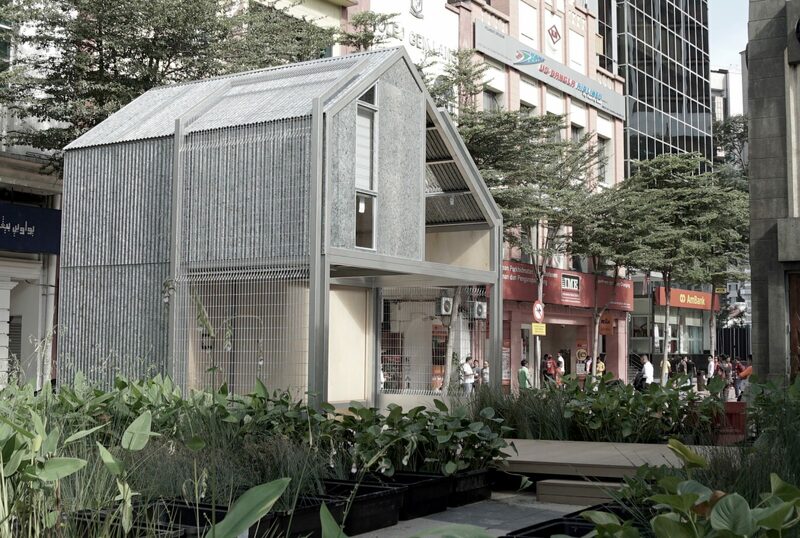 Living in close quarters in tiny spaces in between the tall megastructures of Kuala Lumpur may sound like an excerpt from a local dystopian novel but ThinkCity, who funded the prototype house, is looking to reinvent city living by taking cues from how villages thrive. With only a small private area for your own pantry and a bedroom, other areas like dining rooms, kitchens and even guest rooms can be shared by the community as needed. This prototype house is now located in Medan Pasar, KL, as part of the 2018 World Urban Forum. Hosted in Kuala Lumpur this year, this forum draws urban regeneration experts from across the globe to discuss and share their experiences with sustainable urban development. “Our focus now is on how to manage our cities properly,” said Norliza Hashim, a former urban planner and current chief executive of Urbanice, a government think-tank for urban regeneration. With 75% of Malaysians now living in urban areas, and growing, sustainable urban regeneration is becoming a critical issue, she said. “Interesting” is a given, but for ThinkCity and the designers, it’s important to test the public’s reaction to such a project. After all, they are the ones who will be living in these tiny homes. “At the moment it’s an experiment,” said Mun. For those already keen to sign up for a micro house, you’ll have to wait a bit longer. “We are working out the economics,” said Sek San, adding that they aim to bring down the overall cost of building a microhouse, making it more affordable. The World Urban Forum is taking place in KLCC from Feb 7th-13th, with practical urban development prototypes such as the micro house and parklets, created in street level parking spaces, on display in the Medan Pasar area of the city. For more information, visit wuf9.org.